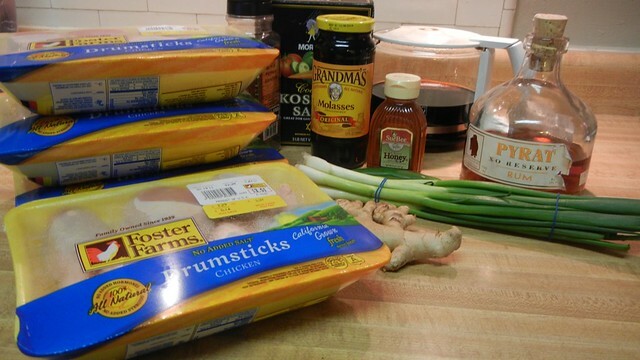 Quick post today as we rush to the finish line of the 28 Days of Super Bowl Recipes. Lots to wrap up around here before we shove off for Dallas at the end of the week. At least East End Brewing has an easy out of they fail. If their beer doesn’t make it to DC, they can just claim the James Harrison defense. This is a recipe adapted from The Great Tiki Drink Book, where dark coffee and dark rum play against the sweetness of honey and molasses and the heat from chiles and pepper. Delightful. 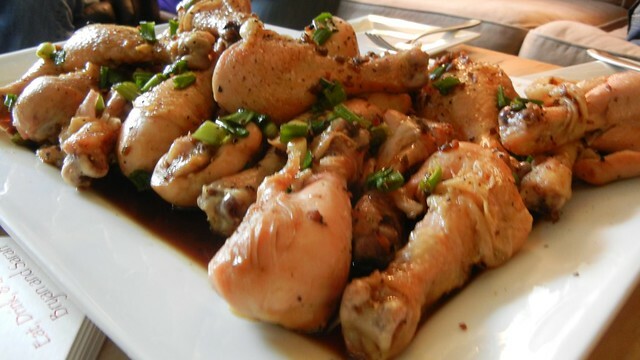 The original recipe calls for using drumettes and thickening the sauce into a heavy glaze, but I’ve found it does much better with drumsticks and as a light sauce. A little extra garlic and ginger and the addition of green onions are pretty much my only other tweaks I’ve made to the recipe. It reminds me somewhat of Chicharrones de Pollo, another rum-and-chicken Football Foodie dish, but this one is a little easier to make and there’s no messing around with hot oil for frying. 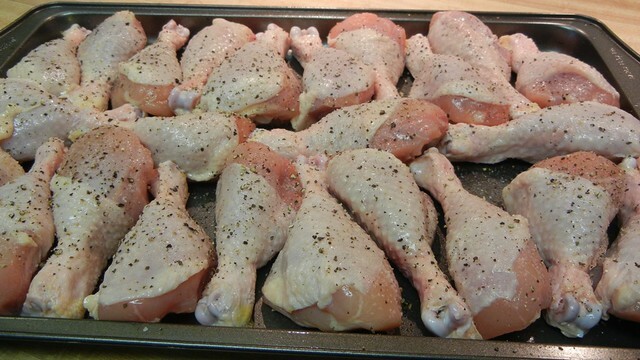 Pat dry all of the drumsticks and set in a lightly oiled large baking sheet. Sprinkle with salt and generous amount of ground pepper. Roast for 35-45 minutes at 400º, until the juices run clear if the meat is pricked with a fork. During the last 15-20 minutes of roasting the chicken, prepare the coffee glaze. In a large skillet over medium heat, cook together the coffee, rum, ginger, garlic, molasses and chile. 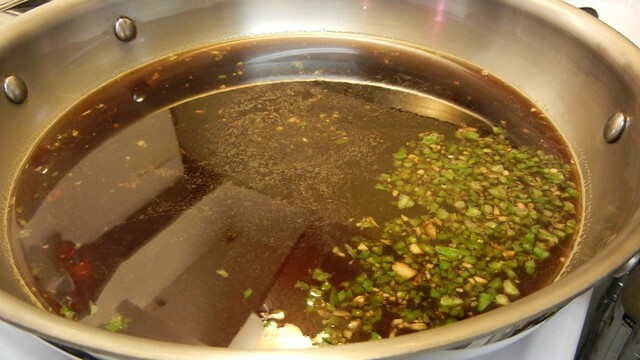 Simmer and reduce, but don’t allow to thicken into a heavy syrup. It should either stick to the back of a spoon or if you take a spoon and drag it across the bottom the pan, it should stay “parted” for a couple of seconds. Once reduced, remove from heat and stir in honey. The original recipe called for it really thicken up, but I’ve found it works better as light glaze. When the chicken is done — the skin show be just crispy — let the meat rest for a few minutes before coating. 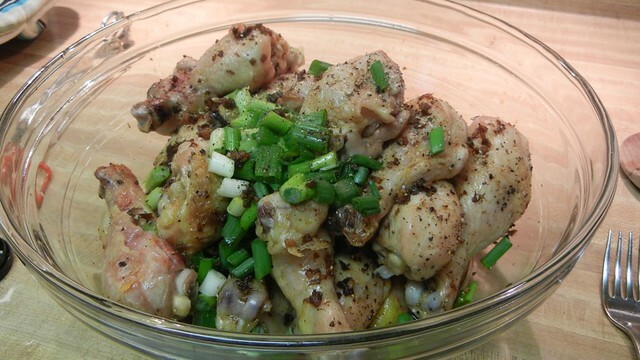 In a large bowl, toss the chicken with the glaze, the chopped green onions and even more ground pepper. Serve! It’s just that easy. The sweetness of the honey and molasses pair perfectly with the coffee and the rum, while the heat from the chile, the garlic and the pepper create just the right amount of heat to balance out the meat. 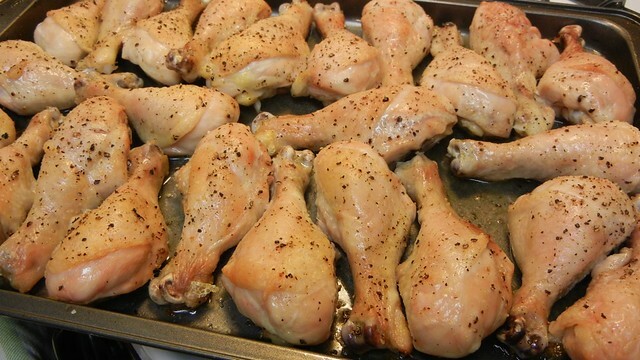 Plan on 2-3 drumsticks per person, so if you need more, the recipe is easily doubled. 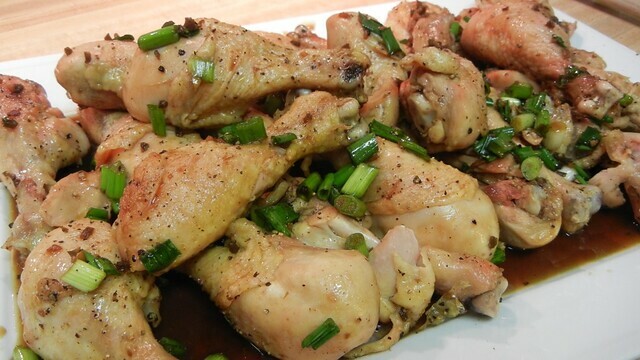 Last made the Coffee Glazed Pepper Chicken Drumsticks during the Seahawks-Bears/Jets-Patriots games. No need to worry about it’s win-loss record for this weekend. Mojo is not in play. Only four more days to go. I loved as much as you’ll receive carried out right here. The sketch is tasteful, your authored material stylish. nonetheless, you command get bought an shakiness over that you wish be delivering the following. unwell unsibqtuonaely come further formerly again as exactly the same nearly a lot often inside case you shield this increase. Just my 2 cents: it’s probably not worth it… I mean yeah, it’s na interesting concept, but it will be pricey and i don’t find that whole convertible screen something I’d want. Plus, I don’t know how reliable those two screen hinges are and how are they going to perform in time.So, I’d probably stick to a classic looking ultrabook, unless you really want that touchscreen or the convertible display. In which case, the Yoga is an option, and so are the new Sony Duo 11 or the Toshiba 920t.